Lately I've been searching for the perfect lightweight jacket. and frozen in a block of ice. Autumn and Spring only last two weeks tops. This year however, it has been cool but not enough to need my winter coat. how much longer I have before I'll need something a little warmer. more of a blazer than anything to keep warm. I love the draped collar and color of this Vince jacket. 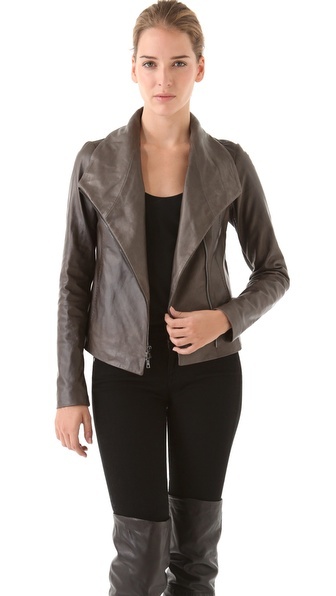 Another leather jacket from Vince. the clean lines on Vince's leather jackets. 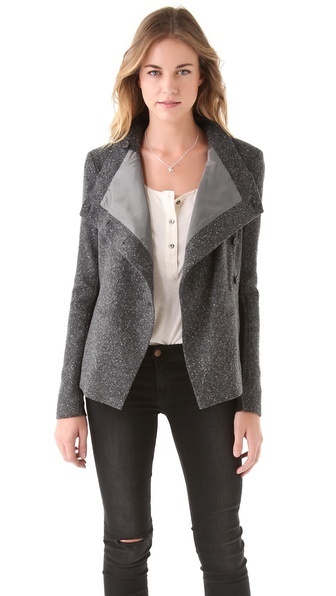 This Joie jacket looks so cozy. Though I'm sure I'd think it looked too much like a robe. Unfortunately, none of these jackets are reasonably priced, hence the "wishlist". I feel like that happens more than it should, but that is life for you. i have a few wool and tweed fall blazers that i ADORE, found at very, very low prices at some local consignment shops.... my local junior league is absolutely incredible! maybe worth a look, for something unique and in budget. That first one is my choice. Love the lines.